Browse hundreds of news articles, product reviews and how-to information. This article is about easy-to-care-for zoanthid corals that are perfect for the beginning reefer. 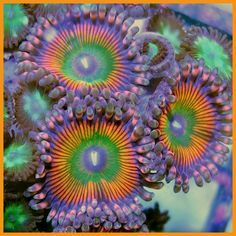 Zoanthid corals, also known as zoas or zoa polyps, are one of the easiest and most attractive beginner level corals. 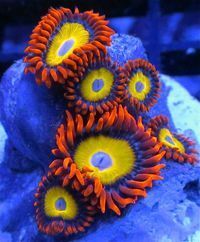 Zoas are a soft coral that will grow across rocks in the aquarium like a sheet. These corals range in colors, size, and rarity, which makes them a coral witha lot of variety. Oftentimes, reef hobbyists will create “zoa gardens.” These gardens are made up of many different types of zoanthid corals and are very beautiful once grown out. Zoa coral care is typically easy, with most zoas being tolerant of a large range of lighting and flow. 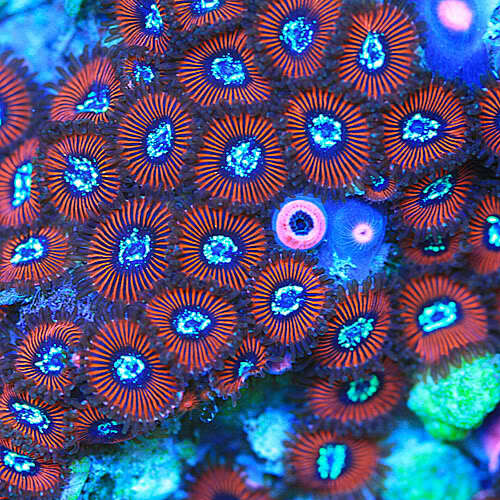 Deep water zoas can be slightly more sensitive to bright light, however with patience, these saltwater animals can adapt to many aquarium setups. With deep water zoanthids, it is important to place them low in the tank, sheltered from the light, or with shorter time frames in which the lights are on, gradually moving up in the tank , or increasing the time the light is on, over the course of a several weeks. The easiest way to grow zoanthids is by feeding them a well-balanced meal of plankton, zoo plankton, phytoplankton, or other small micro sized food particles. They are easy corals that love to eat and reproduce. Zoas typically use asexual reproduction to replicate themselves and expand their colony. If fed and allowed the proper lighting, zoas should grow and reproduce without any trouble. Remember that can and do get some of their energy from the symbiotic zooxanthellae that live inside their tissue, but that is only half of the story. You will be rewarded with strong growth if you feed them regularly. Note that these corals do not need calcium, magnesium, or alkalinity supplements. Regular water changes, bacterial suppliments, nutritional suppliments, and live rock are perfect to help insure that your zoanthid corals are healthy and happy. Use AquaLife saltwater Activate (AL113) to regulate ammonia, nitrite, and nitrate in your reef. Red Sea’s Reef Energy (RS1033 and RS1034) are a perfect addition to the feeding regiment that is being used because it makes the coral grow quickly and healthily. Life Rock (CS1001) allows a place for the zoas to grow, but also for the beneficial bacteria in the aquarium to grow in order to keep regular water parameters. © 2014 Aquarium Connection. All rights reserved.